Manhattan Condos - New Developments - Conversions - Resales: What's in A Neighborhood Name? "Hells Kitchen" or "Clinton"
What's in A Neighborhood Name? "Hells Kitchen" or "Clinton"
Some still argue about the exact boundaries of Hell's Kitchen, but it's commonly considered to run from 34th to 59th Streets and from Eighth Avenue to the Hudson River. The area is also known as Clinton and long-time residents use the two terms interchangeably. Some are proud to call the neighborhod "Hells Kitchen" while some prefer to say Clinton. Yesterday I was showing one of my listings in Clinton/Hells Kitchen. A pre-war Art Deco charmer at Pembroke, 357 West 55th Street. A one bedroom with sunken living room in a circa 1935 6 story coop on a pretty tree lined block. The buyer a long time neighborhood resident said she could never call the neighborhood "Clinton" and her agent agreed. When they asked about the coop board I answered: "They're a regular coop board but the building is not on Park Avenue". The buyer who has lived on the block for many years quickly replied "West 55th Street between 8th and 9th Avenue is called "The Park Avenue of Hells Kitchen." So now you know! The neighborhhood names are interchangeable on real estate websites as well. The NY Times calls it Clinton in or around Midtown and Midtown West and StreetEasy clearly calls it Clinton while on Corcoran.com it's Midtown West. I have another exclusive listing 5 blocks away, a large, corner post-modern loft-like studio at Worldwide Plaza, a white glove luxury condominium occupying a city block in Midtown Manhattan from 49th to 50th between 8th and 9th Avenues. 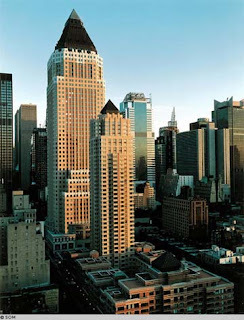 The residences at Worldwide Plaza include a 39-story tower with 654 apartments at 350 West 50th Street. Built in 1988 it was an anchor for new development and gentrification in the neighborhood. For 20 years the neighborhood has been changing. It has become renovated, gentrified. New condo construction along with many new restaurants and bars have opened in the neighborhood. Corcoran.com calls 350 West 50th Street Clinton and gives Clinton boundaries from 34th Street to 50th Street, from Eighth Avenue to the Hudson River. A formerly low-rise area just west of the Theater District lies "Hells Kitchen" or "Clinton", the area is also home to charming row houses. While some still argue over the exact street boundaries everyone agrees it's west of Eight Avenue. East of Eighth Avenue including Carnegie Hall and Time Square is considered Midtown West. What's in a neighborhood name? Call it "Hells Kitchen" or call it "Clinton" or "Midtown West" but what ever you call it the neighborhood is one of Manhattan's HOTTEST neighborhoods and still very COOL! Co-op and condo buyers find that the prices are affordable, and the transportation is great. The Hudson riverfront offers opportunities for bicycling, jogging and kayaking. Ninth Avenue, a Midtown West restaurant row draws both pre- and post-theater crowds and locals to its trattorias, cafes, grills, and steakhouses. According to Brian Williams on NBC nightly News. The best slice of Pizza in NYC is at Sacco on 9th Avenue between 54th & 55th Street. A family run business for more than 50 years named after the town Sacco in Italy. Whatever your lifestyle, budget or architectural preference. Clinton, Hells Kitchen, The West 50's, has something for you. It may be the neighborhood you've been looking for. I've certainly hear of Hell's Kitchen but had no clue about Clinton. Interesting bit of localism. You've presented a very nice overview of the nieghborhood and all the lore about it. So how did it get the name? It will always be Hells Kitchen to me Mitchell...............amazing how that area has gone through so many changes and is now one of the hottest spots in Manhattan. Hi Jeff, Thank you. The name "Hells Kitchen" came about because it was a working class ethnic neighborhood with rough edges known for violence and gangs dating back to the 19th century. "Hells Kitchen" meant hotter than "Hell"
The famous broadway musical and movie West Side Story took place in Hells Kitchen. The famous gangs in West Side Story were the "Sharks and "Jets"
Today it is a "hot" neighborhood again but in a real estate maket way. Located between Chelsea and the Upper West Side, two neighborhoods that have been drastically gentrified over the years, Hells Kitchen is attracting a new generation of folks who may have lived or started looking on Upper West Side or Chelsea then realized they could enjoy much the same lifestyle in midtown west. Hi Ellen, New Yorkers love their neighborhood nicknames. Caruso Lane! Love it! Hi Roger, It's always been "HOT" it's just semantics and one's definition of "HOT" LOL. Mitchell it certainly is interesting all the different names of the neighborhoods .. one side of the street can be worth so much more then the other .. Interesting write up on the community. Thanks for sharing!